Step off the face of the earth and into your own little piece of heaven at Midtown Nails & Spa located in Midtown, just outside of downtown Houston. From the moment you set foot in Midtown Nails & Spa, you enter a different world. In contrast to the impersonal spas Houston usually has to offer, Midtown Nails & Spa makes you feel at home. Individually owned and operated, Midtown Nails offers all spa services including nails, massage, facials, and body waxing. Here, we pride ourselves on a casual and relaxed atmosphere. Our focus is on you and the effectiveness of our services. Our goal is to make your visit to our facility an experience, which enhances your life and well being for years to come. We guaranteed that when you leave our facility, you will experience a feeling of renewed vitality and enhanced self-esteem . Most of all, you’ll be content. Whether you came in for a treatment, or just stopped by for a quick polish change on your toes, you’ll never get the sense that you overpaid. We know you work hard, and we want you to leave feeling rewarded and relaxed. Midtown Nails combines a peaceful, Zen and beautiful environment and more notably for our qualified and certified professional estheticians, massage therapists, and nail technicians. With a highly trained, friendly staff, to ensure you a memorable and enjoyable spa experience. We are not about spa trends, but offer spa treatments providing the utmost in relaxation and rejuvenation, along with the latest developments in body massage therapy, skincare, body waxing, nail care, and other spa services. All spa services are administered by Texas State licensed professionals, who provide beneficial treatments using the highest quality products. 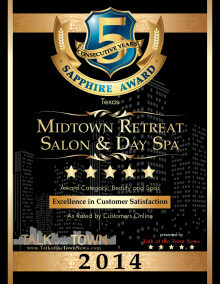 Midtown Nails & Spa was established in September 2007 and has been Midtown’s favorite day spa. As our reputation has grown, so has our clientele and we now attract clients from throughout the greater Houston area.